When Alfa built the original flying saucer — the Disco Volante — in 1952, they were on top of the world. Now there's a new Disco Volante — and while completely different from the original, it's just as gorgeous. And this new Disco Volante, built by Italian design house Carrozzeria Touring Superleggera, is yet another gorgeous example of what a design house can do with an Alfa Romeo as its donor car. Carrozzeria Touring Superleggera claims each Disco Volante 2012 takes 4,000 man hours to build and you have to wait eight months after you send them an 8C Competizione to work on. The Disco Volante is built on the spaceframe of Alfa's 8C Competizione, and shares the 8C's mechanical components. So that means this new Disco Volante is the exact opposite, mechanically, than its predecessor. In place of the old car's live rear axle; the new one gets double wishbones all around. 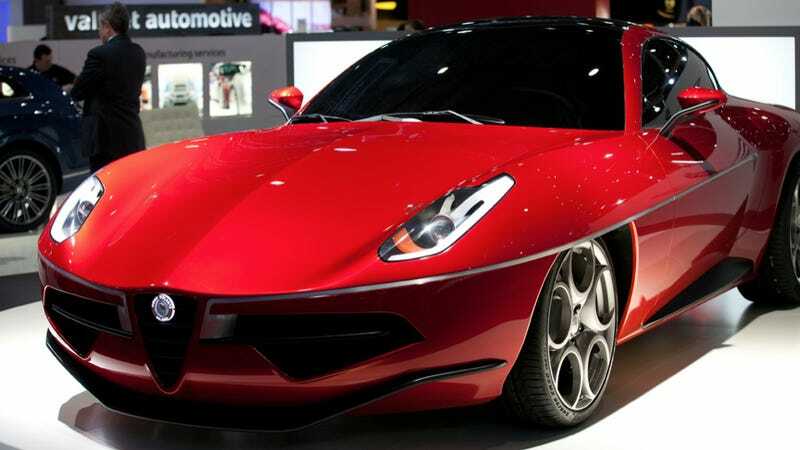 The old Disco Volante had a two-liter four cylinder engine with maybe 160 horsepower; the new one has a 4.7-liter eight cylinder engine with 443 horses. True, the 1952 Disco Volante's unprecedented aerodynamic design is gone, but we can still drool over this new car's shape and dream that it is as thrilling to drive as how we've got imagine its 60-year-old predecessor took to the roads.